Pipe and joint fusion equipment from McElroy Manufacturing, IPEX, Georg Fischer Connectra, Ritmo America and Footage Tools. Keyhole technology from Footage Tools, Utilicor Technologies, SIMCO Drilling Equipment and Buzzi Unicem USA. Mini excavators from Volvo, John Deere, Bobcat Company, Case, Hitachi, Ditch Witch, Kubota Tractor, Doosan Infracore, Caterpillar, New Holland Construction, Kobelco Construction Machinery and Komatsu. Backhoe loaders from John Deere, Case, Volvo, Caterpillar, New Holland Construction, Bradco/Paladin Construction Group, Kubota Tractor and Terex Construction Americas. The newest inductee for the Rental Hall of Fame is the late Herschel “Hotch” Manning. He will be formally inducted on Feb. 28 at The Rental Show in Las Vegas. The New Year brought a new look to the American Rental Association Foundation board of trustees. Charlie Neffle, CERP, of All Occasions Event Rental, Cincinnati, who served as chair, and Dennis Von Ruden of General Equipment Co., Owatonna, MN, both completed their terms in office. Each had served on the Foundation board for three years, with Neffle serving in his leadership position for two. The Bayou Companies LLC, subsidiary of Insituform Technologies, has been awarded a contract with Air Products and Chemicals, Inc., the world’s largest hydrogen producer. National Trench Safety LLC (NTS), a Houston-based company specializing in the rental and sales of trench and traffic safety equipment, as well as OSHA-compliant training classes, recently opened a new branch in Salt Lake City, UT. The Common Ground Alliance (CGA), the leading organization focused on protecting underground utility lines and the safety of people who dig near them, announced a national partnership with United Rentals, the largest equipment rental company in the world. Dr. Bernard S. “Bernie” Lee, passed away on Nov. 7, 2010. Dr. Lee, former president and CEO of the Institute of Gas Technology (IGT), was well-known and highly respected within the natural gas community. With his passion for excellence and his commitment to energy, Dr. Lee’s presence had an enduring impact on the natural gas industry and helped secure a successful future for the organization. BC Hydro began construction in November 2010 on a $200-million transmission system for Vancouver’s central neighborhood, making its first significant investment in the city’s power grid in 30 years. The project includes boring a tunnel under False Creek and building a new substation in Mount Pleasant. After meeting for four years and spending $140 million, the California Natural Resources Agency, U.S. Dept. of the Interior and our other agencies have released the Bay Delta Conservation Plan. The document outlines two goals: restoring the Sacramento-San Joaquin Delta ecosystem and building a pair of tunnels or canal to ferry its water elsewhere. The Association of Equipment Manufacturers (AEM) has significantly updated its compact excavator safety manual and now offers a new Spanish/English version of the material. The AEM Compact Excavator Safety Manual was developed under the guidance of the association’s Attachment Manufacturers Council and Compact Loader/Compact Excavator Council. In Georgia’s DeKalb County, officials say 12,600 gallons of raw sewage spilled near Emory University on Jan. 16. A sewer pipe under Hancock Drive burst, spilling the untreated sewage into Peachtree Creek behind the college campus, according to DeKalb watershed management records. In the just-released construction equipment "business outlook" survey of the Association of Equipment Manufacturers (AEM): •	Construction machinery manufacturers predict overall business in the United States to close out 2010 with 6.4-percent growth, then gain 12.7 percent in 2011 and 14.8 percent in 2012, followed by 2013 growth of 13.0 percent. More than a million feet of sewer and water lines will get a major overhaul in Biloxi, MS, over the next few months. FEMA is funding the nearly $350 million bill to repair existing lines, including storm drains damaged during Hurricane Katrina. The Department of Justice, the Environmental Protection Agency (EPA) and the state of Indiana have reached an agreement with the city of Indianapolis on important modifications to a 2006 consent decree that will make Indianapolis’ sewer system more efficient, leading to major reductions in sewage contaminated water at a savings to the city of approximately $444 million. The Kauai Board of Water Supply has issued a Request for Proposals for a water development project that uses groundbreaking advances in the art of horizontal directional drilling (HDD), while building on existing water development technology in the Hawaiian Islands. The investigative group conducting the metallurgical examination of the pipe is chaired by the National Transportation Safety Board and includes technical experts from the Pipeline and Hazardous Materials Safety Administration (PHMSA), the California Public Utilities Commission (CPUC) and Pacific Gas & Electric (PG&E). Titan Machinery, based in West Fargo, ND, has closed on the previously announced acquisition of certain assets of Fairbanks International and its affiliates. Advertisers from the print edition of <em>Underground Construction</em>, Vol. 66 No. 2. James (Trip) Ferguson III has been named general manager of RePipe Construction, a division of IPR, a leading provider of underground rehabilitation solutions. The American Pipeline Contractors Association (APCA) experienced a “great” year in 2010 with several new pipeline construction projects and expansions of existing pipelines keeping most members busy, reports APCA President Wayne Stringer. The 2011 Congress will be one of the most unpredictable in many years, and probably one of the most explosive too, owing to the partisan friction occasioned by the Republican tide washing over both the House -- where the GOP took over -- and the Senate. The year 2010 had many positive aspects for the Power Communications Contractors Association (PCCA) and its members, observed Kevin Mason as he nears the end of his one-year term as the association’s president. After more than two years of declining revenues, tightening budgets and helplessly watching from the sidelines as their sewer and water infrastructure continues to decay and they are increasingly struggling to maintain current service levels, U.S. municipal personnel are hoping to experience at least a minor measure of improvement in 2011. If one word is used to describe 2010 from the perspective of the Distributor Contractors Association (DCA), that word would be “change,” said Kevin Miller, whose term as DCA president ends in March. Each day, close to 70 million customers in the United States depend upon the nation’s natural gas distribution network, including gas distribution companies and pipelines, to deliver gas to their home or place of business. These customers currently consume approximately 20 Tcf of gas per annum, accounting for about 22 percent of the total energy consumed in the United States each year. Dewatering is a necessary aspect of many underground construction projects. Construction sites near coastlines, rivers, other bodies of water and in other situations may require 24-hour dewatering every day. Heavy rains may fill work areas during storms. It’s hard to believe that a little more than a decade ago, compact excavators were basically unknown in the United States. Long popular in Europe and Asia because their compact size allowed them to work in small areas of large, congested cities, the first Japanese compact excavators that began appearing on American job sites brought curiosity, even amusement, and their potential was not at first recognized. 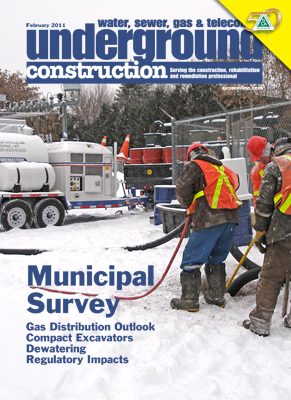 <em>Underground Construction</em>’s 14th Annual Municipal Sewer and Water Infrastructure Survey appears this month. While compiling and writing the report each year is always extremely interesting and revealing, I found this year’s survey to provide a particularly telling insight into the municipal market. ISCO's Snap-Tite, a no-dig culvert lining solution, and the Texas Department of Transportation (TXDOT) Odessa District recently held a demonstration at the Stanton TXDOT maintenance office located a quarter mile north of IH 20 on SH 137 in Martin County, Texas, showcasing how to install a Snap-Tite® liner into an aging and deteriorated culvert. In Wake of San Bruno, PHMSA Calls Oversight of IM Programs "Lacking"
A National Transportation Safety Board (NTSB) hearing on March 1-2 in Washington may push Congress to renew failed efforts from the fall of 2010 to upgrade pipeline safety laws. The hearings will air the NTSB's preliminary findings from the Pacific Gas and Electric Company (PG&E) pipeline explosion in California last September where seven people were killed. The new DBI-SALA 50-Foot Sealed-Blok Self-Retracting Lifeline is designed to withstand the harshest operating environment, and includes features that maximize work site versatility and lower the cost of ownership. The new RR-335 3-wheel self-load trailer has a carrying capacity of 3-3,500 pounds and reels with a 125-inch diameter. The engine powered hydraulic pump raises the reels. Two new models to are now available from Reed Manufacturing’s Saw It line. SAWITSD and SAWITD pneumatic saws feature immediate shut down when the throttle is released and immediate start up with throttle squeeze. The INNSPECTOR-07 PVC Pipe Locator is being discontinued in favor of a new version offering both depth and density indication. Detecto-Pak Infrared – Infrared Gas Leak Detector (DP-IR) is capable of detecting methane without false alarming on other gases. Cretex Specialty Products is now the exclusive source for HydraTite Internal Joint Seals for your sanitary sewer or storm water systems. The 830R/T (receiver/transmitter) system is designed to provide best performance at a high active frequency. It takes a lot to survive a year in the business world, much less 25 years. It’s apparent that Vac-Con, Green Cove Springs, FL, an industry leader in the building of combination sewer cleaning vacuum trucks has found the right combination to make it work. Founded in 1986 when the company employed five people to its expansion in 2011, employing hundreds of people, having a worldwide network of dealers and nearly 6000 machines in service, Vac-Con is a true American success story. Insituform Technologies Inc. announced that its Indian joint venture, Insituform Pipeline Rehabilitation Private Limited has been awarded a contract valued for $5.6 million to rehabilitate approximately 16,000 feet of medium diameter sewer pipelines for the Indian water utility Uttar Pradesh Jal Nigam, located in Northern India approximately 400 miles Southeast of New Delhi. IPR, a leading national provider of underground rehabilitation solutions with offices throughout the United States, has secured positions on some of the most respected business rankings lists, including the Inc. 5,000 list of the fastest-growing privately held companies in the country, the Crain’s Detroit Business list of Largest Environmental Companies in Southeastern Michigan and the Crain’s Private 200. IPR President and CEO Joseph Cutillo made the announcement.